For this unboxing and review…in the interest of saving what little WordPress space I have left, I will just get down to it. You get the new foil card “Nicol Bolas, the Deceiver.” As Bolas cards go, this one is the worst. To be clear, we now have three Bolas planeswalker cards. The classic version remains the most iconic and powerful. There is a new Nicol Bolas, the God Pharoah, and then there’s this. His mana cost is more or less the same. He has three relevant abilities. He might be the worst of the three, but he is still quite significant. With Intro Packs Planeswalker Packs, the Wizards said they want to give people splashy cards to learn to play with. If this isn’t splashy, I don’t know what is. I assure you…if you’ve read my other reviews of Planeswalker Packs, then you know what unboxing this is like. It is exactly the same! There is a plastic bubble and a little black tray. All of the other contents are in a deck box. Here is the deck box, posing alongside my FUNKO POP! version of Bolas. Inside you get two booster packs, two pieces of paper, and the deck sealed in cellophane. I will go ahead and tell you that I didn’t get any important cards in my two packs. The two pieces of paper are a guide to playing Magic, and a poster that has strategy for playing this deck. There is also a handy decklist. Here are the rares that came with the intro deck. This makes my fourth copy of the Throne. Visage of Bolas is new, and I’m certain can only be gotten by purchasing this deck. This deck is surprisingly creature-heavy. Normally, Bolas wants a control deck. But here are the creatures. The Wasp of the Bitter End is a card that you can only get in this deck as well, but it notably says “a Nicol Bolas” planeswalker, meaning that it is a card that can work with the other two versions of Bolas. We get a bunch of basics, and importantly eight fixers. Cinder Barrens is one of those intro-deck-only cards. Crypt of the Eternals is a clever new Grixis tri-land. Which means we have instant and sorcery cards remaining. Normally, you would cancel and destroy everything until you could draw and cast Bolas, pretty much for the win. In a normal constructed deck. This time, your strategy is a little different. You are going to play creatures, (I will mention that Aerial Guide is probably the best card for this deck, since it flies and draws you cards.) You hope to get the Visage of Bolas, which will then get him in your hand pretty much guaranteed, and then you will pretty much guaranteed be able to cast him if you do all of this at the appropriate time. Now this plan depends on who you are playing against. Against other intro decks, great! But in a serious environment, when you fetch up your Bolas, they will know you have him, and either cancel him, hold their kill spell, or do some kind of Thoughtsieze (Liliana) effect and make you discard him. Visage of Bolas is a four drop, meaning you are probably never going to be able to play him on the same turn that you cast it. (If that were the case with this deck, we would be talking about turn 12 at least! Competitive Magic decks want a turn four or five kill. I think this is a great product to get people interested in playing MTG. But it is wrong to call it a Standard deck. It IS. But it isn’t competitive. You could just as easily discourage people from playing if they bought this, and then played it in a tournament and find themselves wrecked every game. The packaging is nice. The box can hold sleeved cards, but has no solution for dice or tokens. It’s still better than the old intro pack boxes. I’m still asserting that if they want people to feel like they should play these decks in a tournament, then they should include sleeves. I played against a newcomer during the sealed tournament this weekend…and how did I know he was a newcomer? First impression…no sleeves. Then they way he played reflected that. I have played four matches using this deck, even a few “mirror matches,” and I just can’t get excited about it. I do like the new Bolas card, but Nicol Bolas, God Pharaoh is better for Standard. Maybe there is a good way to exploit the specific cards in this deck that only come with this product…like Visage of Bolas. But you better be able to produce a ton of mana early. The wasp thing is cool, but I think it better for a Bolas Tribal commander deck. It’s just going to net you some extra value for playing Bolas. So I am going to rate this deck at 2/5. It’s kind of flat. Now the SpartanKid thinks otherwise. He believes I am being too harsh, and he likes the idea of an “Eternals” tribal deck. I will keep you posted about what happens…He might even make a standard deck that riffs on the intro deck. So the SpartanNerd rates Nicol Bolas, The Deceiver Planeswalker Pack 2/5. Do you agree or disagree? Let me know in the comments! Long time no blog. Sorry, Hub City Geeks. But I’m back with a treat! As you can see, for Father’s Day I got the Archenemy Nicol Bolas set! And I am unboxing it for you today! The top image is the front of the box. Nice artwork. And you know you are getting something nice! Mine was actually slightly cheaper, as the Tangled Web in Spartanburg is holding a sale…everything 15% off! The back has some inspiring words, and a picture of some of the content. Opening the box, you are greeted with this. I was a little puzzled at first. Also, note that upon removing the cellophane and the price tag along with it, you can see some information. Ages 13+, 2-4 players, and 30+ minutes. What I’m telling you and showing you is that this is the first really successfully executed MTG all-in-one board game style set! While there is Arena of the Planeswalkers, which is “Heroscape” with Magic characters, Archemeny: Nicol Bolas retains the gameplay of Magic the Gathering. And just like any dedicated board game, there is some setup. I was confused by the big white thing. What that is is an envelope, and it contained the four deckboxes, which you will have to assemble. The scheme cards are loaded with flavor. And I think there also may be some spoiler content from the upcoming “Hour of Devastation” set. Check out “A Reckoning Approaches.” Is that Razeketh on the card? Next I will unbox each deck and show you a picture of the rares. I will also point out the important commons and uncommons. All of these cards are reprints. OK. First let me say I am disappointed that these aren’t foil planeswalkers. AT LEAST BOLAS SHOULD BE FOIL. And while we’re at it, why didn’t they give us an oversize Nicol Bolas as well? OK. Rant over. Let’s look at the tokens first. They are double sided. One image shows one side. The other shows the same cards flipped. It seems we should be making lots of horrors, zombies, and soldiers. Now for Nicol Bolas, Planeswalker‘s deck. Wow. This is a lot of rares! And so many things fly. Blood Tyrant…That guy’s a winner! Don’t have what you need? Prognostic Sphinx will get you there. Here is a needed reprint of Dreadbore. I almost think Harvester of Souls is a little boring at this point. How many times has that been reprinted? Icefall Regent was recently a big deal in standard. Archfiend of Depravity has been there…but never really shined. Bolas is a three color card, and it’s good that we get Dragonskull Summit, a buddy land. Here are the commons and uncommons. Lightning Bolt. YES. Doom Blade. YES! Extract from Darkness has been fun in commander. Slave of Bolas. This is my first “upgrade.” I picked up a foil over my recent vacation. Because Bolas is a three color character, you get some mana rocks that help you fix your colors. And you get these lands, notably Crumbling Necropolis. Each of the Planeswalkers in this set are pretty good, but Bolas is the most satisfying. Still, he costs a ton to play. Luckily, his deck helps get him out a little earlier with certain cards. These are some all-stars in white! (well, maybe not Aegis Angel and Lightwielder Paladin.) As I looked at these rares…I knew them right away. In the case of Fiendslayer Paladin, that guy was incredible in Theros/M15 standard. Sun Titan. Need we say more? Odric Master Tactician is so good he right out finishes regular matches of Magic if he hits the board with some friends. Gideon Jura is an OK card. There are certainly better versions of Gideon out there. But this version is good and balanced for this set. -2 the Gideon to remove some of Bolas pesky fliers. These cards are also pretty good, with excoriate exiling tapped cards. Fencing Ace was the title of my deck back in Theros/Ravnica standard. Pairing him with Fiendslayer is great. The Flickerwisp…It turns out that Bolas can steal your planeswalkers pretty easy using the scheme cards. 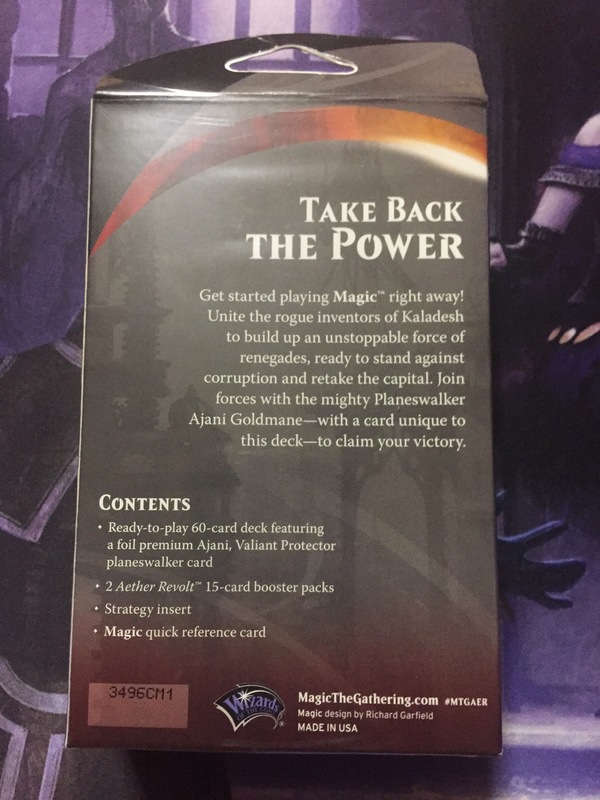 But Flickerwisp says “return to the battlefield under its OWNERS’s control.” Which is just sick. Bolas can steal your Chandra, and you can just steal her back! Dualcaster Mage, Grim Lavamancer, and Inferno Titan. These cards are terrific! I don’t know if Dualcaster made a splash in Vintage or not, but this was one of the predictions when it was first printed in Commander 2015. This is my first copy of Grim Lavamancer…he is a staple in the Modern burn archetype. Hammerhand and Coordinated Assault help your guys get through. Searing Spear…this is NOT LIGHTNING BOLT. Chandra now has at least three pre-constructed decks, and none of them have the best burn spell in them. That said, Searing Spear isn’t bad, it just can’t outpace Lightning Bolt. Volcanic Geyser. Why not just include Fireball? The geyser has the advantage of being an instant, but it is one red slower. Chandra’s card is one of the best Chandras they ever printed.. Seeing that she has NINE DIFFERENT CARDS, that’s saying something. But a great many of those are not really tournament playable. This one is a contender. Gavin Verhey, who was the lead designer on this set, proclaimed in the now famous preview duel on the Mothership website, said that Nissa’s deck could do the best with a long game. And that may be because this is a two color deck, while the other two are mono colored. She does have more resilient threats, but it takes longer for anything to get going. If Bolas sweeps the board and Thragtusk is there, you at least get a beast in his place. Forgotten Ancient can get out of hand really fast, (He was recently included in the Atraxa Commander deck.) Oran-Rief Hydra is big to start with, and just gets bigger. The Nissa card here is the best of the three Gatewatch planeswalkers. She pays for herself the turn she comes out. She makes lands into man-lands. And ultimateing her can be GG, if Bolas doesn’t sweep the board on the next turn. I just got it yesterday! But there has been some playing here in the SpartanNerd Household. Last night me and the SpartanKid sleeved up Gideon and Bolas and had a traditional one-on-one. The funny thing is, that worked pretty good. It was a cute match, where each side would gain an advantage one after the other. But eventually, Bolas overpowered him. Today, I ran the Gatewatch myself against the SpartanKid, who played Bolas as Archenemy. This match lasted about 70 minutes. It seemed everytime I would get some traction, the scheme cards would undercut my progress. That big splashy spell every turn really makes this a special set. But it is also HARD. This was a fun time, and it could only be more fun with more players. I will have to keep you posted here on SpartanNerd.com about future matchups. SO WHAT DOES THE SPARTANNERD RATE ARCHENEMY:NICOL BOLAS? It’s a terrific product, and the Board Game feel of it is very nice. Check it out. Here is my Archenemy packed up and ready to play. But believe it or not, I had just put the top back on it and shook it around. The tray inside is perfect for keeping this set contained. Even the life counter has a well designed spot in the set. I haven’t sleeved the tokens or the schemes, but they fit nicely in their original spot underneath the deck box un-sleeved. So this is a well designed package. Well designed experience. And I COULD take for instance, the Grim Lavamancer to a tournament to play. And that is one of the rewarding things about collecting the sealed products the way I do, at least for Modern. Some of the included cards here are very nice. I wish the Planeswalkers were foil. That is one of my complaints. You pay $59.99 for a MTG product, there better be some foils. Because these are all alternate art cards, they won’t be printed in foils unless the Wizards decide to reprint them in the future somehow. You could get foil regular printing but that shouldn’t feel necessary. The decks included are tailored for multiplayer matches, and so that is one of the narrow focus things about the set. But you could play any decks against Bolas you wanted to, I suppose. So I am going to rate this product a 4/5, knowing that my opinion will change the more I play the set. Do you agree or disagree with the SpartanNerd’s rating of 4/5? Let me know in the comments! So with the release of AMONKHET, we now have not just one, but two new Liliana cards! Liliana has long been my favorite planeswalker, as I owned Liliana Vess way back when I opened her in a core set pack that I purchased as I started to get into the game. Liliana Vess plus Grave Titan was just AWESOME! I continued a legacy of loving the cards as I drafted a Liliana Vess back in M15…and I remember when I began to get into standard heavily main-decking Liliana of the Dark Realms and I remember getting the emblem, and then spectacularly topdecking Rakdos Return for a win…everone in the room made a noise when I did that! (Wow! AHHH! Ugh!) Topdecking stuff like that is one reason why I love playing black. How did I get Liliana of the Veil…such an expensive and rare card? A friend gave me a booster pack of Battle for Zendikar, and I opened a Zendikar Expedition Marsh Flats, which I traded for Liliana of the Veil. Pricey-ana is an important piece of “the rack” deck, as well as an enabler for re-animation in the “Gifts Ungiven” deck. A five-drop Liliana. But this is where the similarities to Liliana Vess end. I think they costed her out at five though, because her top two abilities are absolutely use-able very relevant abilities that are worth five mana. If she gets removed next turn, your investment was not in vain! The art on this one is also some of the best art depicting the character. I really do like how snobby and in-charge she appears. Liliana is the ultimate “mean girl.” Maybe I like the art on Heretical Healer//Defiant Necromancer better? The -7 ability on this card is a sweeper. But the problem is that little word, “destroy.” There are a lot of indestructible creatures out there in standard, especially the new “god” cards. But also Gideon. Also that she only gets non-zombies can’t be ignored. There are and will be mirror decks, as well as emergent zombie decks. I wish I had a foil! You know those lists of bad cards that people sometimes make? Liliana of the Dark Realms makes that list occasionally. Yeah, yeah. The flavor is a little off. It takes a while to ultimate. You have to play mono black pretty much. And what’s with the hair? But this card just bumped that Liliana off the list. Why? OK. Seven Drop. In a mono-black deck, it’s going to be at least a full seven turns before you play this, if you aren’t doing DARK RITUAL, or some other crazy acceleration trick. Which most of the time you won’t be doing. If you wanted ramp, your color would be green…. -3 Destroy target creature with a -1/-1 counter on it. Let’s math for a minute. 3>2. So. you just lost that progress you made last turn, PLUS ANOTHER LOYALTY POINT. -10 Return all creature cards from your graveyard to the battlefield. How is this ultimate not strictly, strictly, strictly worse than the original Liliana Vess’ ultimate ability, that takes all creatures from all graveyards and puts them on the battlefield under your control? Now I’m quite aware why this card is the way it is. The art is big and splashy. A nice foil. And new players will be attracted to the looks of this card. Which is exactly the point. Liliana, Death Wielder can only be gotten in a Planeswalker Deck, the equivalent of an intro pack, (which the Wizards don’t make any more.) I can see a kid really digging this card. But I think I am going to keep her in the Planeswalker Pack with the rest of her deck. She’s just too bad for my special commander deck. I have played this card against the SpartanKid a couple of times, and found it to be lacking in every department except for the art and flavor departments. I have yet to try it out against the Gideon Planeswalker deck, but all accounts out there on the internet say that his deck is better, and partly because his Planeswalker card is better. Review of the Liliana Planeswalker Pack will be coming soon! Ajani, Valiant Protector is the foil for Tezzeret, Master of Metal as far as intro decks go for Aether Revolt. I unboxed Tezzeret, and just felt I needed Ajani to complete the duel. Ajani’s deck came in the exact same packaging as the other Planeswalker Packs have. It is a printed sleeve, which covers plastic tray with a display window. All the contents are actually inside a deckbox, (an excellent deckbox, by the way.) The only piece that isn’t is the “splashy” planeswalker card. Environmentally concerned MTG players can feel pretty good about the minimal use of packaging with these decks. Here is the entire contents. 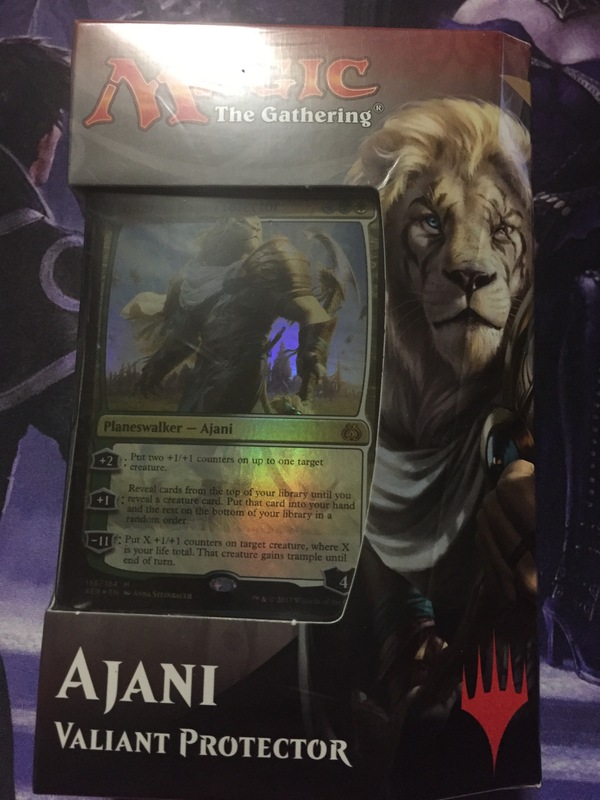 The special Ajani, Valiant Protector card, a guide to playing the deck, a quick reference guide, two Aether Revolt booster packs, the nice deckbox, and the deck wrapped in cellophane. Let’s have a look at the planeswalker. Right away I can tell you that this card isn’t as good as Tezzeret’s. Tezzeret can reach ultimate after three turns. It is going to take a lot longer for Ajani. The upside is, getting two +1/+1 counters on a creature is not shabby at all. His +1 ability lets you filter up your creatures. If you do happen to get to ultimate, you probably win. The guide to playing the deck heavily features pictures of Ajani. You also get a decklist. And something I failed to mention about Tezzeret’s deck. This insert kind of tells players what to purchase next if they really like playing MTG. The Planeswalker Packs are great entry level products. The only way they could really improve the experience is include sleeves…or even better. Go ahead and sleeve the cards, so a person can crack the box and play in a tournament right away! Pre-shuffle it even. It’s pretty clear that Ajani’s deck is supposed to depend on the Revolt mechanic. Basically something canhappen if a permanent left the battlefield this turn. In other words, the deck wants you to be able to bounce, sacrifice, or give up permanents. But if you study the cards carefully, you will see tbat there aren’t that many ways to trigger revolt outside of losing permanents in combat. There are a few exceptions…but not really enough in my opinion. But am I getting ahead of myself? There are a few cards that you can’t get anywhere else besides buying this product. Ajani’s Aid is a big one. And enchantment that lets you tutor Ajani out of the your deck or your graveyard. (Hang onto that thought!) You can sacrifice it to prevent damage from a singular creature. Ajani’s Comrade is another, which gets a counter if you control a planeswalker called Ajani. (Opening this card up to the other versions of Ajani out there. Goldmane, Caller of the Pride, Mentor of Heroes, Steadfast, and Vengeant. Did I miss one?) Inspiring Roar is another card exclusive to this deck. AND that card is indispensible for keeping the power level up against Tezzeret. (Which is why there are four copies I’m sure.) The other card is the white and green tapland. This deck really only has one removal spell. The classic, “Prey Upon.” Everything you do in the deck depends on combat, pretty much. How does the deck play? It is a weak white-weenie deck. The creatures are typically slow. While Narnham Renegade could be good in Modern if you cracked a fetchland on turn one, most of them aren’t that great. They want Revolt to trigger, which usually means you have to wait until Main Phase 2 after you lost something in combat. Which is a bad deal, typically for a deck whose card advantage rests almost entirely on the battlefield. So, nope. This deck isn’t as impressive, or effective as Tezzeret’s. Planeswalker that isn’t as good. Strategy that isn’t as good. Let’s prove it! Here is the showdown between the two decks, as promised. Round one. SpartanKid (Tezzeret) vs. SpartanNerd (Ajani). Basically, Tezzeret only drew Islands for lands, giving Ajani the opportunity to get Narnham Renegade onboard and hit them over and over with Inspiring Roar. Yes. Three copies. This time Ajani’s deck began with three forests and drew into a fixer. So a much slower start, made very clear as Tezzeret began to get things on the board. Ajani loses round two to dumb luck. The same way Tezzeret lost round one. I held Solemn Recruit in my opening hand, who requires two whites to play. Round three. This is why we play the game of Magic! Basically, Tezzeret, Master of Metal hit the board right on turn six. It was another three turns before I drew into Ajani. I played my Ajani, to a board where I had three creatures, including Solemn Recruit. I +2 Ajani, knowing that Solemn Recruit has double strike, and would get ANOTHER counter because of revolt triggering. This was my strategy to win! Unfortunately, the SpartanKid had drawn Tezzeeret the Schemer, and went ahead to ultimate Tezzeret Master of Metal. This meant he took control of all of my artifacts and creatures. And then proceeded to swing at Ajani. Keep in mind that Solemn Recruit still had summoning sickness. I drew the best card I could have drawn in this situation. Ajani’s aid. I had enough mana to play that card, as well as replay Ajani, who I then +1 into nothing really. (Narnham Renegade) The SpartanKid then unwisely sent all of his creatures at Ajani once again. I chump-blocked the biggest thing I could with my deathtoucher, and Ajani hit the graveyard again. But my next draw was the second copy of Ajani’s aid. Still, there was too much momentum going for the SpartanKid. I sacrificed both of the Ajani’s aid for the prevent combat damage effect on the double striker, but that wan’t enough to stave off a loss. Just some commentary. Sure, this proves the Tezzeret deck is better. But the way that I was able to get Recurrance out of Ajani, that was fun. And that is why this is a great product for a new player. I failed to mention…Tezzeret also got one tutor back out of the graveyard as well along the course of the matches. I am going to rate the Ajani Planeswalker Deck from Aether Revolt a 4/5. It is a fun deck to play. You get an almost perfect entry level MTG product. You get exclusive cards. I took the point off because it doesn’t seem to be that balanced against Tezzeret from Aether Revolt. If I had to choose one of these to take to a tournament, it would certainly be Tezzeret. The SpartanNerd rates Ajani’s Planeswalker Pack 4/5. Do you agree or disagree? Let me know in the comments! Aether Revolt snuck up on me this time. I wasn’t able to attend the pre-release, but did draft on release weekend. I went to the draft “cold turkey,” having not researched any of the cards. Believe it or not, I drafted two “Fatal Push,” probably the most important card released in the entire set. In case you didn’t know, “Fatal Push” is a one-drop instant black kill spell. A card that is bound to be useful in Modern, as the only cards that have filled that role until this point have been Path to Exile and Lightning Bolt. I went through all that, hanging out at the Tangled Web all afternoon, and I never even saw the new Planeswalker decks. Maybe they were there…maybe they were sold out? The first time I even had a clue that such a thing had released was when I saw it at Wal-Mart. I snatched up Tezzeret, and here was my experience. Not pictured is the plastic case that is the main part of the packaging. It forms a nifty little tray…I just haven’t figured out how to use it yet. The contents of the box are really in this deck box, which prominently features Tezzeret, Master of Metal for its art. This is the same style of box that Nissa and Chandra came with, and it is a great little box to carry sleeved cards in. I personally think the Wizards are hitting a homerun when they make these Planeswalker Packs. New players want planewalker cards, rare cards, and new players want to feel like they fit in when they come to a tournament. Most tournament players have fancy deckboxes, etc. So this is an all around great product for the new player. The only thing lacking is actual sleeves. Here are all of the contents. Two packs of Aether Revolt. One foil Tezzeret, Master of Metal (which can’t be acquired officially any other way than opening this product.) The deck sealed in cellophane wrap. And two pieces of paper. One is the guide to playing the deck. The other is the Magic the Gathering Quick Reference Guide. If any Wizards product should include the Quick Reference Guide, it is the Planeswalker Packs. Let’s have a look at this splashy card. Tezzeret is the strongest Intro Pack planeswalker I have seen. His +1 ability could be a game changer. It is so-so in this deck, but imagine a deck where there were four copies of some incredible artifact. (Here’s a list. Platinum Angel. Sword of Feast and Famine. Elbrus the Binding Blade. Black Lotus. Need I say more?) Tezzeret can plus up and get that in your hand! And all the extra cards you overturned? You just shuffle them and put them on the bottom without consequence! To -3 Tezzeret on what is likely turn five or six won’t be that great. But the bottom -8 ability is bonkers. And because the +1 ability, and the starting loyalty is 5, it’s not even that hard ultimate Tezzeret. And then it’s GG. The guide to playing the deck is a big pretty poster, featuring Tezzeret and giving us some story. We also get the decklist, in case we modify the deck, or want to keep it together. This information is available online, in case you lose it however. So what cards are here? There are some cards here that are exclusinve to this set. These are Standard Legal, too, incidentally. They are Submerged Boneyard (the blue and black tap land), Pendulum of Patterns (four copies), Tezzeret’s Simulicrum (which gets a bonus if you control any Tezzeret Planeswalker), and Tezzeret’s Betrayal which lets you kill something and tutor Tezzeret Master of Metal. I’m a fan of decks like this because the cards have lots of value built in. Many of the artifacts here have card-draw effects attached to them. Notable, when Treasure Keeper dies, you get to cascade! Because tricks like this are built in, Tezzeret doesn’t have to rely so much on cards like Reverse Engineer. Another feature of the deck is Tezzeret’s Touch. This card is reminiscent of Ensoul Artifact from M15…a card that made the “death scissors” a fringe winning strategy during the Kahns of Tarkir period. This card has an advantage on that one, though, in that it has the ability to return the artifact to your hand if it gets destroyed. The creatures in this deck are value-types. Tezzeret’s Simulicrum is just good stuff. And even better if you have a Tezzeret on the board. (Lightning Bolt every turn. Ouch!) Augmenting Automaton has the classic pump ability built in. I will say that I don’t get much out of Improvise as a mechanic. It is just bad Convoke. Most artifacts have “tap to activate ability.” If you tap them to pay for a ridiculous creature, then you just lost value. How does it play out? Well, this deck really works! I have yet to test it against the other Planeswalker Pack, Ajani. And I think that will be the true test. So far the deck has taken out the SpartanKid’s Tron deck, BUT, he did have a bad draw. I suppose this time I will let you in on what I pulled from the booster packs. Prepare to be JEALOUS. It might be early to rate this deck because I haven’t played it that much. However, I suspect I will be rating it a 5/5. Like I said, this is my style of deck, with lots of tricks. And it is black and blue, two of my personal best colors. I will update my rating after I get my hands on the Ajani deck, and have them play each other! Now for my second review of the new Planeswalker Packs…Chandra Pyrogenius. If you read my review of Nissa, Nature’s Artisan Planeswalker Pack, then you know exactly what I am about to unbox! Only this time flavored with Chandra, the reddest of the planeswalkers. You get a different blurb on the back of this one. It accomplishes the goal of letting you know what the deck is all about. And it mentions the uniqueness of the cards in this deck. So here’s Chandra herself. Take in this Jank! You get a “Shock” as a +2 ability. Or “Flamelash” as a -3 ability. For six mana. The -10 ability is a sweeper, which is of some interest. The Wizards purposely “nerfed” this card. It isn’t supposed to be big in Standard and Modern, though it is legal in those formats. In other words. They made a janky card on purpose. BUT WHY? Being a “burn” planeswalker, you would think that Chandra’s deck would be loaded up with Lightning Bolts and similar. Not so much. Instead, she has lots of creatures. Chandra has vehicles, while Nissa didn’t. Some of these cratures are really good. Fleetwheel Cruiser is awesome right away, and might be the most valuable card in this deck as far as tournament play is concerned. Speedway Fanatic has Haste, and Gearshift Ace has First Strike…these guys pretty much force players to learn the rules of combat. Chandra has flyers, something else that Nissa’s deck didn’t have. Flame Lash, Stone Quarry, Liberating Combustion, and Renegade Firebrand can all only be found here in this deck. Liberating Combustion lets you tutor out your Chandra, and as I said in Nissa’s review, it serves an important role. I don’t think Renegade Firebrand is going to matter that much. But what might matter is Flame Lash, a four-drop instant burn spell that does four damage to a creature or player. No, it’s not as good as Lightning Bolt. But this could be an important card in Standard. Recently Stoke the Flames was very relevant, and it had a similar effect. HOW DOES THE CHANDRA PLANESWALKER PACK PLAY? Like Nissa, I have tried this against several decks, and it generally wins. A good bit actually. It isn’t anywhere near as good as the Chandra Nalaar Duel Deck that was balanced against Jace. But against other duel decks, intro decks, and challenge decks, this deck usually wins. I think MTG has powered down since the Dual Deck anthology decks were printed. But this deck does fine against anything printed since Return to Ravnica. I have the opportunity to tell you now that Chandra, Pyromancer has beaten Nissa, Natures Artisan” soundly every time. The two decks feel like they were meant to be a duel deck balanced against each other. Maybe I’m just better with Chandra’s deck. Not sure. But I haven’t seen Nissa get a win yet when playing against Chandra. Partly because there is sufficient creature removal in four copies of Flame Lash and in rolling Chandra down. The first striking and vigilance (and flying) creatures in Chandra’s deck are just better than the tramplers in Nissa’s deck. So I am going to give Chandra a 75/100 as far as this is a playable deck. I RATE THIS DECK A 5/5! The Wizards are doing a good thing by printing this as an entry level product. Planeswalkers have lots of appeal to new players. Especially in foil. The deck works well against most pre-constructed decks. The after-market value of this deck is better than $15 with the inclusion of Fleetwheel Cruiser and Flame Lash. The SpartanNerd gives Chandra, Pyromaster’s Planeswalker Pack a 5/5. So do you agree or disagree? Let me know in the comments!